Miss Snark, the literary agent: Boil this! Dear Miss Snark: Given how generous you have been with your advice, I hate to bother you with this, but I'm not sure how to approach it. I have been offered representation by a reputable agency with a very well-liked agent. She emailed the contract to me to look over. I have a file of things to look for in contracts. Most of it seemed fine. However, I remember your irritation with contracts that expect reimbursement of expenses. In addition to the aforementioned commissions, Agency shall be reimbursed for the expenses incurred on behalf of the Work (not to exceed a total of $150.00 without the written permission of the Author), including photocopying, messenger, cables, and overseas postage in connection with submission for sales both foreign and domestic, long-distance phone calls, copies of the published book when purchased by Agency for subsidiary rights submissions, and other similar and related charges. Agency shall bill Author periodically for such expenses, or deduct same from funds received by Agency for the Author's account. I have no problem asking her about this, but am not sure if this is standard boilerplate language since she said this was a standard contract. Would you mind giving me your thoughts on this? The missing clause is "after your work is sold and funds received". The Snark Agency will bill you for postage, copying and other costs specifically related to the sale of the represented works. This cost will not exceed $300 without your consent. You will not be billed until your work is sold and payment received. If they don't sell the work, do they expect you to pay expenses? I'm a writer, and I don't believe the language in this agreement is unfair at all. 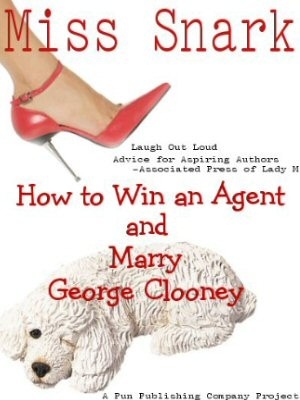 I would think the relationship between writer and agent would be one based on mutual faith -- the agent having faith in the writer's work and the writer having faith in the agent's ability to market that work to publishers to the best of the agent's ability. I'm sure there must be hundreds (if not thousands) of great books that never sell despite genuine, valiant effforts made by agents. So, why should an agent not get some compensation for the time, energy, and cash spent even when, unfortunately, the market doesn't respond favorably to the writer's book? $150 really doesn't sound like a lot of money for an author to render up in exchange for all the photocopying, shipping and handling, phone calling, and emailing (and yes, emailing does cost money because most agents don't have free Internet access, unless of course they work out of the basement of their local library), among everything else the agent has to deal with. Trust, but verify, someone said. Pardon me, Anon, but one wonders if you're exclusively a "writer." Miss Snark, I beg to differ. In the 15 years I've been an agent, I've worked in three agencies now: a boutique headed by an aging industry icon, a large, venerable agency, and am currently a partner in a small, hip shop with 4 agents. ALL agency agreements at these agencies say that such expenses shall be billed to the Author or deducted from Author's commissions. Maybe William Morris and ICM eat Author's expenses, but most of my boutique agent pals follow the above protocol too. In the past couple of years, and this year especially, we're submitting so much of our work via email, the client's expenses are practically nil anyway. If I can't sell it, it's my problem, not theirs. And I'm a solo shop. I must be a nitwit. I still don't understand why it's OK to charge for expenses after the work has sold. I appreciate your stance on expenses before a sale, very much, but I don't understand why the sale changes it for you. How are photocopying and mailing expenses different than the light bill? Why don't those expenses come out of your commission, like I'm assuming other overhead expenses do? Is it just because it's the way that it's always been done, and therefore continues? In my business world experience, I've hired agencies who, in addition to their standard fees, will also itemize office expenses like the ones we're talking about. That makes sense to me, because I've hired them to do a job and they're going to pass along associated costs to me. But the agent/author relationship seems different to me. If you were my agent, you would have taken me on because you believed in the work, because you wanted to sell it....not because you thought I was nice or wanted to do me a favor. So why does the investment of risk end when the work sells? Actually I don't think you're a nitwit at all. Some agencies don't charge for expenses ever. Some, like mine, don't pass on expenses if we sell the work for under a certain amount. The point I'm stressing is IF the agent does, then it's AFTER a sale. It's an accepted industry practice to charge for expenses. I haven't really ever thought not doing it. But, trust me, you don't want my heat, phone or gin bill. Count yourself lucky you never even have to see those. Compare this to another kind of agent, a real estate agent. I doubt if there are many real estate agents who charge their clients for copying all those sign fliers, the newspaper advertisments, the sketch artist (if there is one), etc. up front. Instead, their expenses come out of their commission after the property sells. I've been with my agent for 12 years, at 3 different agencies, and we've done 4 books together. Suddenly today a payment arrived with deductions for office expenses...for the first time ever. It was never discussed, and though it wasn't a lot of $,it came as a shock. What is the protocol for this situation? Clearly he should have given me a heads-up. He seems surprised that I didn't know (though he never told me). I'm steaming over this. I can't see why an agency, after deducting 15 percent of my income, should pick my pocket for stuff like copies when they are running a multi-agent office. Is this really standard? And if it is, why don't authors stand up and cry foul?